Our first visit to Canada’s beautiful Glacier National Park was thwarted by Mother Nature’s tempestuous (90km/hr!) blasts two days ago. We evacuated to a private campground, Canyon Springs approximately 30km (19 mi) to the east when Parks Canada closed all three National Park campgrounds in Glacier. So we took another visit to the beleagured area, both to view the damage and to enjoy some of the fine attractions. Yesterday we walked Giant Cedars Boardwalk, a short tour through an old growth rain forest. Tried to walk Hemlocks Boardwalk and Skunk Cabbage Trail. Both closed by windblown trees yesterday, but we heard they opened again this morning. This is a beautiful area with a lot to do. 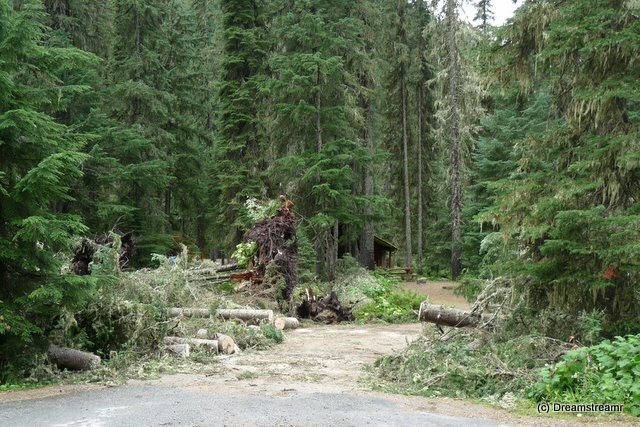 Today we returned to Illecillewaet Campground to find the windblown trees still strewn about the entire campground and all loops still closed. 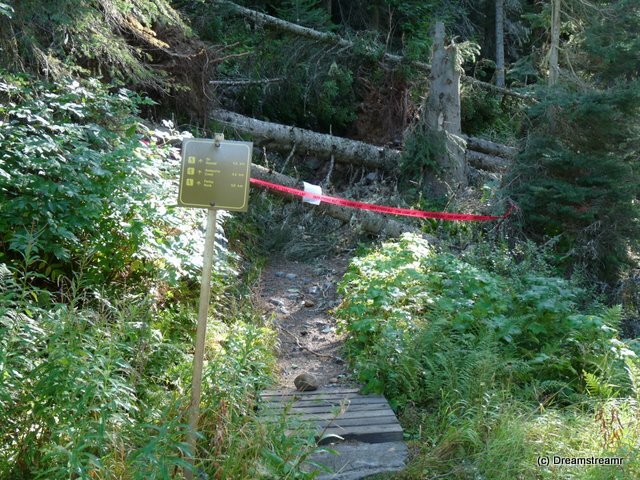 Most of the trails are open, attesting to a great amount of effective work by Parks Canada crews. The crews started during the storm Thursday, as soon as the worst gusts passed but while the rain was still pouring down. Their emphasis apparently was to reopen the trails, and they largely succeeded. We parked and hiked above the campground. 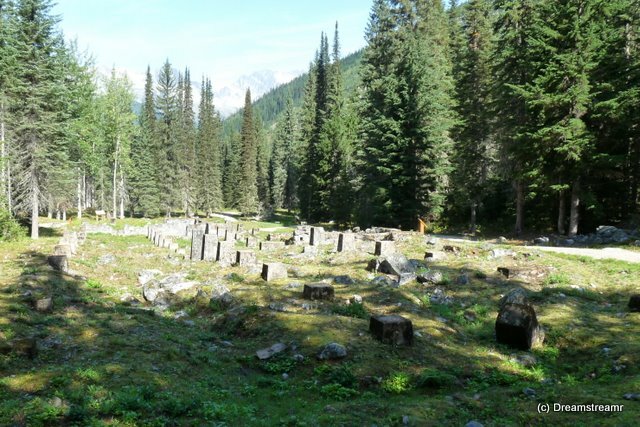 The trails all start near the Glacier Hotel ruins. This hotel, according to the plaque descriptions, was one of the grandest in “the West” at the turn of the century. But CPR vastly underestimated the dangerous challenges of maintaining the 1885 rail line. The rail line was too exposed to avalanches, rockslides, and treefalls, and 62 company men lost their lives trying to reopen the blocked rail lines the first 25 winters. A terrible tragedy occurred in 1910 as CPR’s workers were trying to clear the tracks from an avalanche. A second avalanche covered them, killing almost all the workers and crew members. 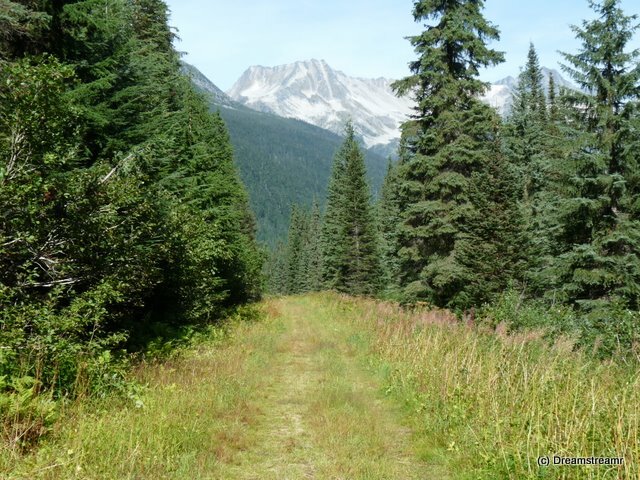 CPR almost immediately started creating a new tunnel and rail line route to avoid the most dangerous sections of this passage through the Selkirk Mtns. And in 1916 CPR abandoned the 1885 rail lines, effectively isolating their own great Glacier House hotel. The hotel struggled on for ten years without convenience of direct rail service before CPR finally closed it in 1925 and eventually, in 1929, demolished the hotel. It appears people have scavenged everything portable from the burnt ruins in the past 80 years, except the concrete piers, a couple of bathtubs and two boiler firetube sections. But it is easy to imagine this hotel in 1900 offering unequaled comfort amidst great natural beauty. And the guests had many activities to choose from. CPR retained Swiss hiking and climbing guides to accompany and assist guests on the many trails and mountain climbing opportunities. Glacier House became “the” North American mountaineering destination with its many unexplored peaks and new trails. CPR capitalized on the attraction with aggressive marketing campaigns to attract guests interested in tea and croquet on the lawn or arduous peak-bagging and glacier expeditions. We walked past the hotel ruins along the former rail bed of the 1885 line. 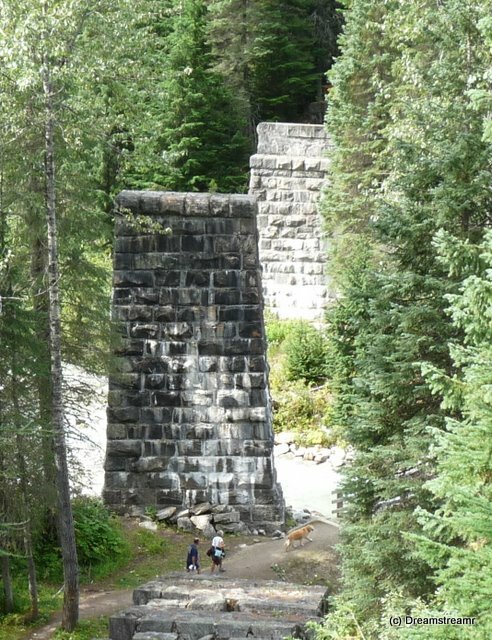 This is a nicely maintained 4 km (2.5 mi) trail to the Loop Brook trestles, a set of tall and stark stone trestles with 26.5 meter (86 ft) spans between them to bridge the small gorge. Now the trestles are a reminder of the bold work CPR completed for the cross-Canada rail contract. 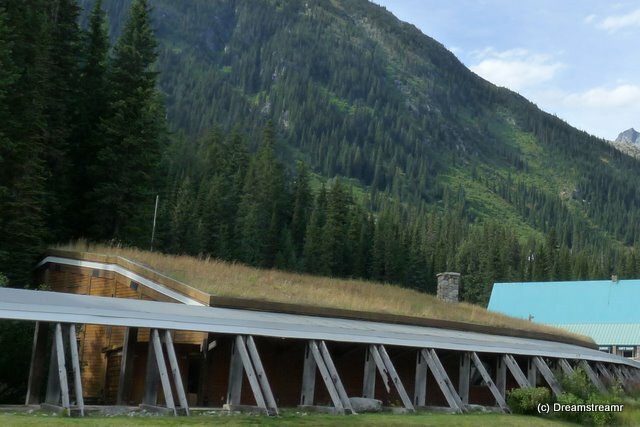 After our hike we drove a short distance east on #1 to the Rogers Pass Discovery Centre. Parks Canada provides a nice museum, two small theatres, a gift shop, and a backwoods trail registration desk. We gained the most information we’ve found yet on grizzlies and black bears avoidance and response manuevers for hikers and campers. And we found a very nice book on CPR’s railway development west from Winnipeg to Vancouver. We’ll talk about the book again later. A good day of touring in Glacier NP (Canada), and now home for the night. Tomorrow we take off for Kamloops, to Paul Lake Prov Park. See you there! Thoughts of staying extra days in beautiful Yoho NP rolled away yesterday as we headed west on TransCanada Highway #1. We’ll find another gorgeeous campground down the road. It has worked so far, right? 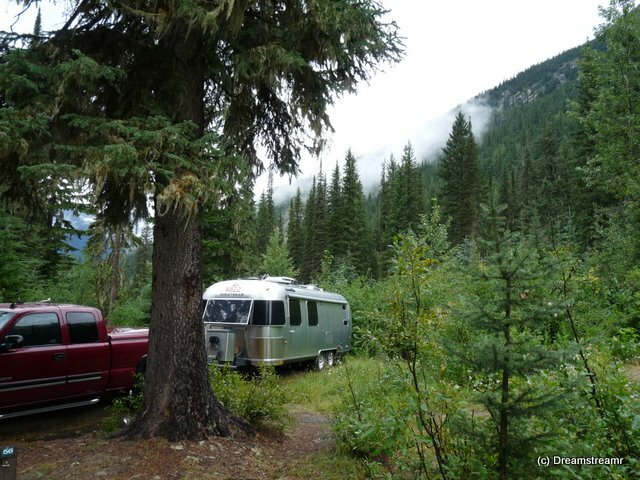 We headed for Glacier National Park, with several campgrounds. We won’t find electricity, water, or sewer connections. And that’s okay. We will, if our luck holds out, find a campsite large enough for our not so large rv trailer. And if we can get good sunlight for more than one-half of the day, our solar panels will keep our batteries happy. We pulled into Illecillewaet (“rushing water”) Campground at 11:30 hrs local time. 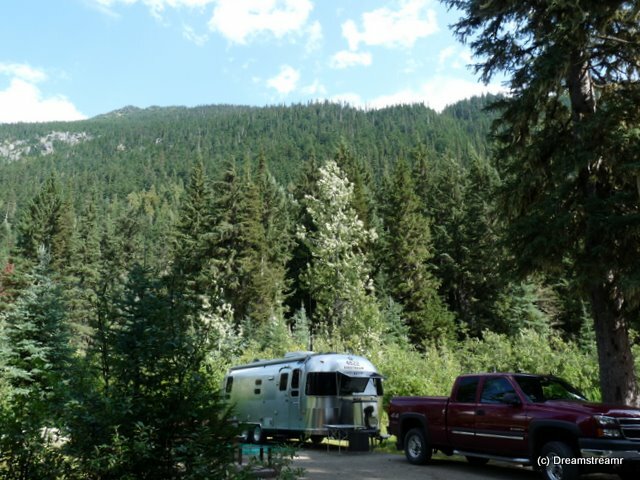 A campground with good sun, close to the river, and just the right length for our truck and trailer suited us. The park ranger suggested we not pay for five days up front because the weather was not going to be good and he could not process refunds if we changed our minds. We committed for three days instead, and thought we could renew later. It took only a little while for us to set up camp. Jim decided to locate the generator under the shelter of the trailer’s back bumper, connect it to the trailer, and charge our batteries since the day is so cloudy. We put out our green “rug” to help keep the trailer clean. “Alice the aloe” found a nice partial shade spot on the picnic table, far better to her than the bowels of the truck bed. Deb fixed us a sandwich and a cup of tea and we planned our after-lunch hike. Five minutes more and the wind flips our campsite rug upside down and throws it toward the campground road. Alice Aloe is turned over by the wind. Our doormat similarly launches, but in the opposite direction. Jim runs out and rescues Alice Aloe first, putting her under the trailer, then balls up the rug and stuffs it under the picnic table. 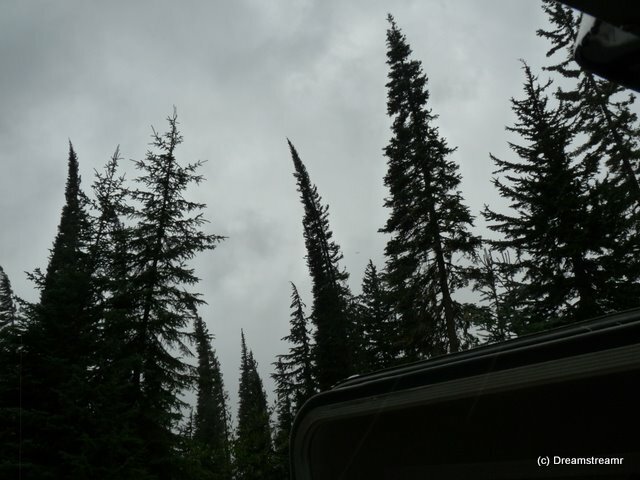 The wind is picking up fiercely, jetting into the many trees around us, it is raining, and scads of little hemlock needles are blowing into the trailer’s door each time Jim opens it. We start hearing thundering noises. But wait! Those are tall hemlock tree cracking in half and hitting the ground around us. Look there, beside the CanaDream! 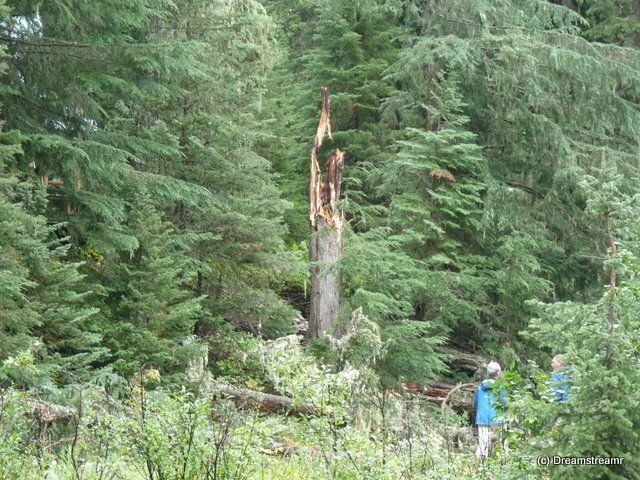 A 38 cm (15 inch) diameter hemlock tree broke four feet above the ground and landed squarely along the top of the picnic table. Trees just up the hill, 60 meters (200 feet) from us, are turning over and crashing to the ground with loud booms. And what about these three tall hemlocks just 15 meters (50 feet) from us, waving wildly, bowing and dipping, and curving toward our trailer and truck? Jim said to Deb, “The strongest structure inside the trailer is between the refrigerator, the pantry, and the vanity, where all the casework will stand up even if a tree lands on top of our trailer. Don’t be in the way if I see a tree coming and dive headlong from the living room to the bedroom floor.” We thought it pretty likely we would get smacked by something airborne. A small limb flew onto the roof of the truck, knocking down the magnetically-mounted CB antenna, and landed on the windshield with a lot of lichen and bark debris. The dancing trees nearby held, well if not firmly, safely for now. The rain let up after a long half-hour. 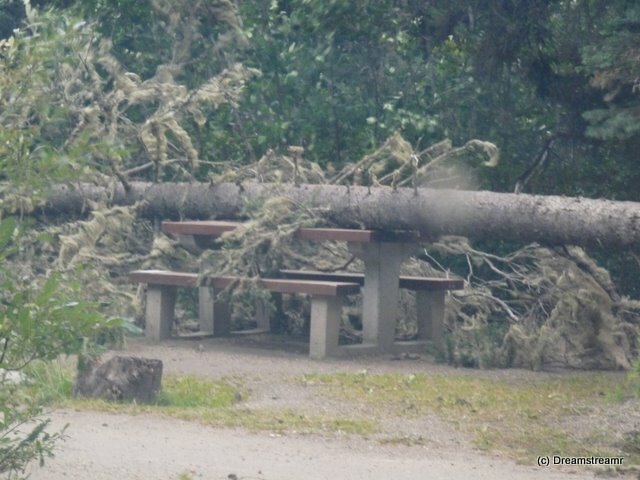 And we saw hikers returning, snapping pictures as they walk by of the broken tree atop the picnic table. But where is the German couple from the CanaDream across from us? They were the last to leave and would have been caught on the trail in the worst part of the storm. Would they pick a particularly large trunk tree to cower under, hoping it held fast? What if another tree fell against it and slid right down the trunk to their hiding place? Would they perhaps find a hikers shelter, sturdy enough to withstand falling behemoths? “If they aren’t back by 3:30, I’m going to notify the park rangers”, Jim said. The rain halted almost entirely so we gratefully deplaned our little aircraft. I mean, we stepped out of the rv and stared at the huge tree just across the driveway, covering the picnic table and extending forever beyond it. Other people appeared in the driveway, a couple from the States, from Washington, and here are the two from Germany. They are shaking, not from the cold, they are shaking with relief. When the storm blew up so quickly, they found their way immediately to the ruins of The Glacier House. The Glacier House was, at the turn of the century, one of the grandest Canadian Pacific Railway hotels on the line. The CPR tracks route changed, and the abandoned hotel became nothing but ruins. And this German couple was so grateful parts of the building withstood the century of entropy. They were able to huddle under the shelter until the storm passed, but afraid any falling tree could collapse their meager shelter. National Park trail crews from nearby had started clearing the campground’s driveways with chainsaws and a front-end loader before the rain stopped. But clearing the trails may take days. 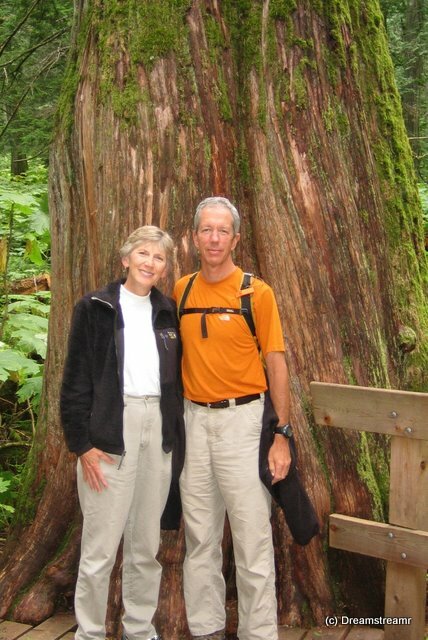 The German couple picked their way slowly down the hiking trail, climbing over or scooting under downed trees across the trail. And they safely returned to the campground, shaken and in disbelief at what just happened. The afternoon was sunny and warm, and suddenly raining, gusting, and the temperature had plummeted by 11C (20F). How’s this for their travel story to the Canadian Rockies? The experience of a lifetime, eh? Shortly, NP rangers walk through the campground and tell everyone it is time to leave. Glacier Park is closing all three campgrounds and no one is allowed to stay. “Where will we go? We’re from the States, we can’t just go home.” “There are National Park campgrounds in Revelstoke, 110 km (70 mi) west of here. Or Canyon Springs is a private campground only thirty km (19 mi)from here. And we’ll have this place open again as early as tomorrow. You can call and find out, if you want.” We packed up as rapidly as we could and pulled back onto the highway after 1600 hrs local time. We have, all summer, arrived at every destination campground as early as 1030 hours and by not later than 1400 hrs. And here we are starting out (for the second time today) after 1630 hours. How is this going to work out? The campgrounds are likely to be swamped with other National Park refugees, like we are. There’ll be no spaces left, we will set up in overflow somewhere. We crossed into the Pacific Time Zone, affording us another hour of daylight. We pulled into Canyon Springs to find all the driveways barricaded because of downed power lines in this private campground. So we turned into the DO NOT ENTER driveway and made our way to the campground office. For eight dollars more per night we are staying a few nights in a private campground with mineral springs ($$), a pool ($), a sort of a restaurant, a store, hot showers ($1=3 minutes) , laundry (expensive), and free wifi. Not so bad. And we are still within striking distance of the Glacier National Park attractions we want to visit. Hopefully we will enjoy a stay another time in Illecillewaet Campground. It is a jewel tucked into the valley in Glacier National Park. The river rushing by the campground is delightful and blanks out highway or railway noise, if there is any. We couldn’t tell. We’ll look forward to another stay sometime.